Be one of the first Retailers to sell Mini Melts Ice Cream in your area. Mini Melts is now available in New York, Pennsylvania and Ohio. Mini Melts Brand and Global presence provides instant product recognition. Mini Melts sells itself. 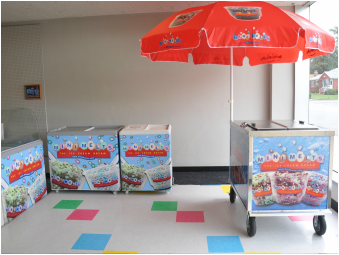 Listed below are some of the equipment that can enable you to enter the profitable world of selling ice cream. Mini Melts is "The Ice Cream Dream". SERVING FREEZERS. Add to your existing concessions area or ice cream store with our seamless implant method. This is the easiest and fastest way to add Mini Melts to your business. The serving freezer has the capacity to showcase 6 or 8 different flavors. The serving freezer comes complete with a sneeze guard, sliding glass doors, serving bins, scoops and graphics. UMBRELLA CARTS. Perfect for indoor or outdoor locations and can be easily transported to your events. VENDING CARTS. Perfect for indoor or outdoor locations and can be easily transported to your events. Our carts have a completely self contained water system with hot and cold water and a 3compartment sink. PREPACK/GRAB n GO COMCESSION FREEZERS. Our prepack freezers are ideal for gas stations, convenience stores, gift shops and concession areas. The 5.2 cf freezer stores 240 prepackaged single servings and the 7.1 cf freezer stores 320 prepackaged single servings of Mini Melts ice cream. VENDING MACHINES. The coolest way to make money! 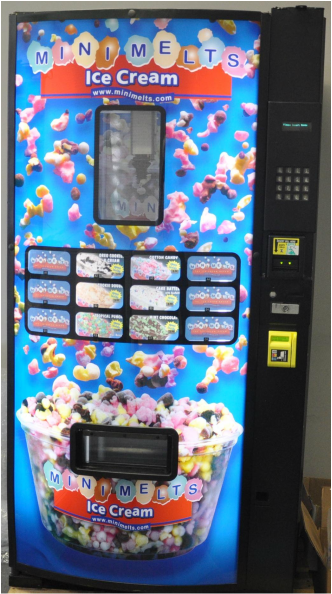 Our new state of the art robotic vending machine will make you money, indoors or outdoors, day or night. 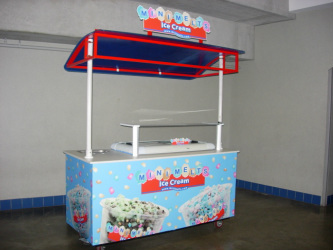 Mini Melts vending machines can be found at Malls, Family Fun Centers, Bowling Centers, Miniature Golf Courses, Roller Skating Rinks and many other family oriented venues. JOB OPPORTUNITIES. Commissioned Sales People, Stock Clerks for Vending Routes. All Carts and Freezers meet Government Health Requirements and Regulations.